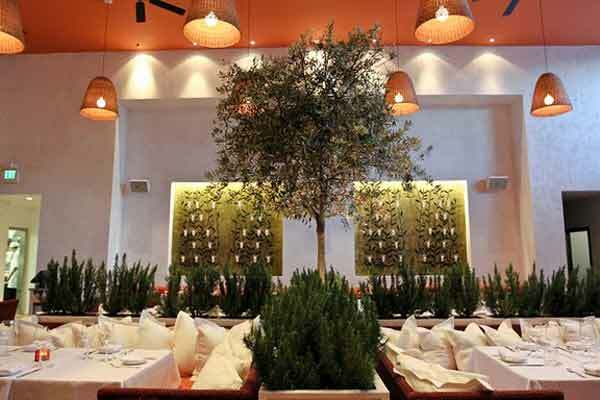 Last week, before a party, some friends and I met up at Fig & Olive. The space is gorgeous. There’s a ginormous fig tree in the center of the main room and it is open and bright and lively and the presentation of the locally-sourced food is beautiful and simple and fresh. It was a rainy night and we lucked out with a banquette tucked away in the corner. We shared appetizers. We got drunk on glasses of red wine. It was lively and noisy and by the time we left, the room was crowded. We traipsed off to a party, slightly tipsy in heels. The rain had stopped. The streets were shiny. There were more glasses of wine ahead and, later, more eating — french fries at the Chateau Marmont. A good night out needs french fries as a nightcap. Eat: An assortment of cheeses; Provence Vegetables and burrata; Mushroom, truffled artichoke, parmesan crostini; Prosciutto, ricotta, fig, olive, walnut crostini; Riviera shrimp and salmon salad. This entry was posted in Food and tagged cocktails, drinking, drinks, Eating, food, friends, Italian, restaurant, restaurants, wine. Bookmark the permalink. Fun times!!! I have been wanting to try the desserts- yay or nay? Didn’t get to try them! But if you’re looking for a partner in crime, I’m always up for dessert!